In a shocking change of pace, I am actually going to take a quick break from discussing original raw import manga, and instead talk about Venus Capriccio, a cute shoujo series that has been translated into English and licensed for release in the US by CMX. I actually have the Japanese volumes of this series too, so I can even manage a comparison, I think. I am always happy when shoujo series get licensed, since it seems so often that only shounen series get love from US publishers. I am all for releasing more fun shoujo titles, and more titles from Hana to Yume/Hakusensha would be great. CMX has done a fairly good job with this volume. While the cover does look a little bleak in comparison to the Japanese version, what with all that white space everywhere, the characters themselves are very pretty. I love the coloring of their hair and eyes. I kind of wish that they could have used a more close-up/cropped version of the picture. The sparse cover and the goofy font makes it look sort of amateur. Even the simple background frame on the Hana to Yume tankoubon version would have been better. However, the back cover beats out the Japanese version hands down. It features another lovely illustration of our main couple, but the background is not so plain. It is a lovely illustration. Still, we shouldn’t *ahem* judge a book by its cover (who am I to talk here…) because this really is a fun series, and I am very glad it was licensed. This is the story of childhood friends. Our heroine, Takami, is having awful luck with boys. Part of her problem is that she is very tall and, having been raised with 4 older brothers, she is a hopeless tomboy. She can’t help it that she doesn’t act or dress in a very feminine way. Will she ever be able to land a steady boyfriend? Takami does have a friend who is a boy, but he is not her boyfriend. Two years younger than Takami, Akira is a beautiful and delicate guy who first met Takami when they were young children. Takami had been forced by her mother (who was worried about Takami’s tomboyish habits) into taking piano lessons. Akira, already gifted at the piano while only in 2nd grade, was appointed to be Takami’s teacher. They have been friends ever since. Even though he is a guy, Takami doesn’t really see Akira that way. He is her best friend and confidant, and his beautiful looks make it easy for her to forget he is a guy. He is like a kid sister! But Akira has other plans. After years of watching Takami, Akira finally confesses his love to her. And with one amazing kiss, she realizes that he is definitely not a kid sister. Akira is a guy, and now Takami will have to start getting used to the idea. Even though he is only 14, Akira is one of those serious and princely types, who is mature beyond his years. This series follows the adventures of the rough and tomboyish Takami as she discovers that the transition from friends to something more may not be so difficult at all. Together they get to face all those things that shoujo manga couples have to face — jealous rivals, stalkers, crossdressing, exciting school festivals, amusement parks, and more. This series is extremely cute! Akira’s maturity is a bit hard to believe (he is too perfect! No 14 year-old is like this!) but his confident and sincere affection for Takami is adorable to watch. Takami is great, as well. Even though she is awkward when it comes to feminine things, she is a strong, confident character, who speaks her mind and is not afraid to help others. I don’t have a whole lot of experience with official English language manga releases. It is a novelty for me to actually read manga in English! The translation looks good, and there aren’t really any overly-distracting localizations in the dialog. But the volume isn’t perfect. There are a couple of typos (“It’s out turn!” instead of “It’s OUR turn!” and a place where Takami’s name suddenly has a hyphen in it and is printed as “Taka-mi”) and the occasional bit of sloppy art editing — places in the art where it is obvious that the Japanese sound effects have been edited out. But those are minor quibbles, and, for the most part, I think they did a great job with the book. All the sound effects, the teeeeeny tiny dialog that is always written in microscopic handwriting, the honorifics…. it’s all there. good job. I am very happy that CMX translates the little sidebars with the comments by the mangaka. However, due to the format of the English release book, some of the comments don’t make much sense anymore. For example, in sidebar comment#2, the author mentions using her sister’s painting supplies to color the picture on “the inside flap.” However, this CMX edition of the manga doesn’t have an inside flap, so it isn’t immediately apparent what art the mangaka is talking about. I checked my Japanese volume, and it turns out the inside flap is the same artwork that appears on the back cover of the book. It would have been helpful if they had included a footnote to explain this. While this is not an overwhelmingly deep or insightful series, it is cute, attractive, and fun. At a total of 5 volumes, this series is not too long and not too short. I am hooked with volume 1, and I look forward to reading more! I admit that I want to see Akira sweat a little when it comes to his relationship with Takami. He is a little TOO confident (though in an adorable way, really :). Perhaps I am a bit mean in wanting to see him have to work harder? Heheh! 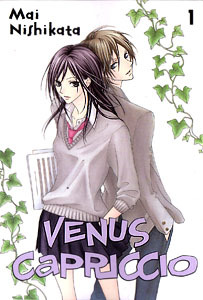 I am so happy when shoujo series get licensed, and I hope everyone will check this title out! I love the idea of you comparing the English version with the original Japanese version. I’m not sure if someone contributed this idea to you in your suggestions or if you just thought of it yourself, but it’s a great idea and I’d love to be able to see more of these reviews in the future. Also, I’m a big fan of CMX—they do have some editing/typo issues (the sideflap/backcover illustration issue came up in another series I read, but in that case they did make a note in the freetalk panel to explain), but they pick such great and unusual series to publish that I just want to support them all I can. It’s great seeing them get recognition on your site! !